The second part of a look at the back half of the Globe and Mail's name. 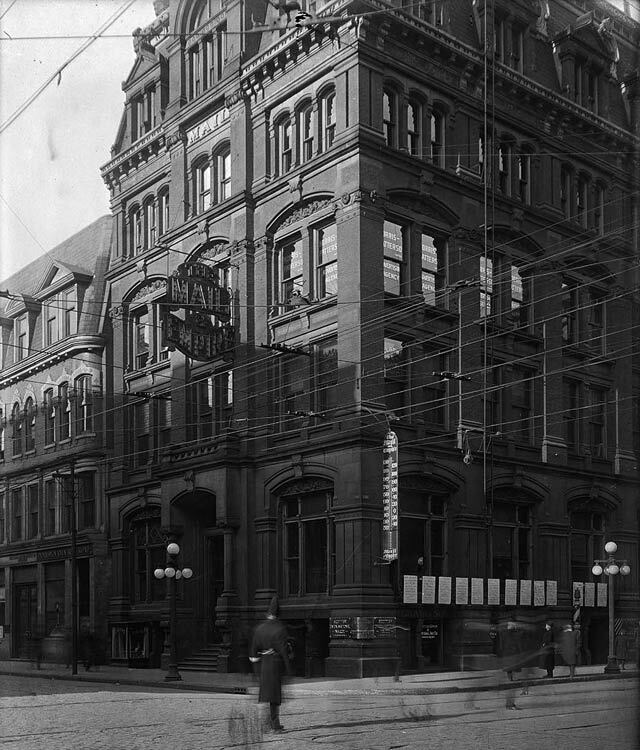 Mail and Empire Building, northwest corner of King and Bay, December 30, 1913. City of Toronto Archives, Fonds 1231, Item 2037. In part one, we looked at the birth of the Mail and its evolution from Conservative party mouthpiece to independent editorial voice. 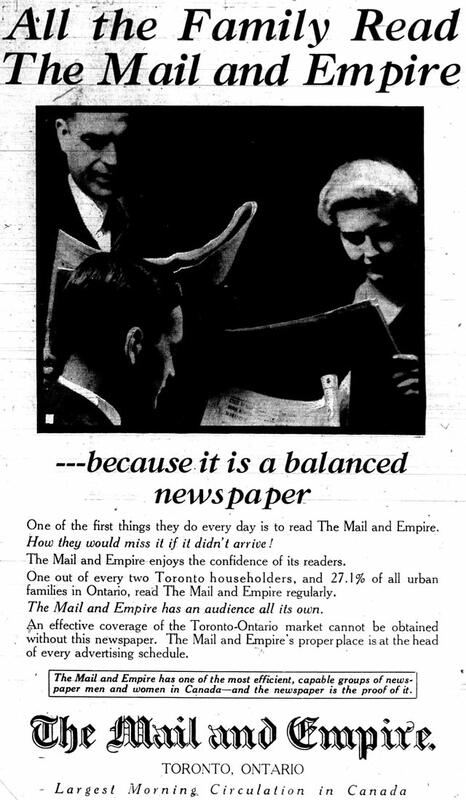 An amalgamation having been effected between the Empire and the Toronto Mail, both of these papers cease publication in their present shape today, and a new paper, to be called the Daily Mail and Empire, will make its first appearance tomorrow. The losers in the merger were former Empire employees, few of whom were kept on. When Prime Minister Mackenzie Bowell refused to offer temporary clerkships for the upcoming session of the House of Commons as a reward for party loyalty, an enemy of the deceased paper came to the rescue. Ontario premier Oliver Mowat, a Liberal, found jobs at Queen’s Park for the displaced employees. 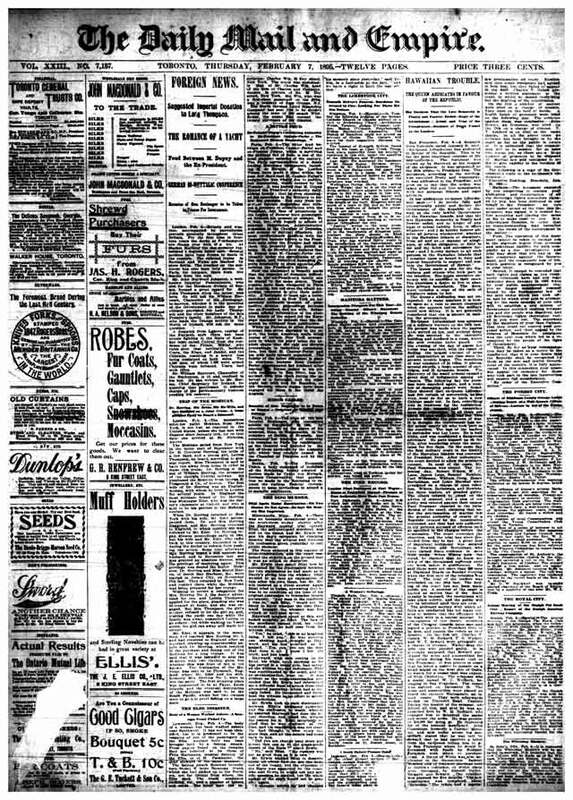 Front page of the first edition of the Mail and Empire, February 7, 1895. While the competition argued that the paper dodged outlining its editorial policy, any questions about the Mail and Empire’s direction were answered by looking at its management, which closely resembled the Mail’s. Charles Riordon retained an ownership interest, serving as president through 1927. While ties with the Conservatives tightened, general manager Christopher Bunting insisted on retaining the editorial standards he developed during the Mail’s independent spell—a quality daily could not be guided by political party leaders. Unfortunately, Bunting barely enjoyed the new entity, as he died less than a year after the merger. The Mail and Empire, while devoting the utmost care to its news, thus rendering its columns interesting, instructive, and, above all things, clean, is in its editorial policy, frank and outspoken regarding the great interests of the country. Pursuing its own course, giving its own comments on passing events and public concerns, it extenuates nothing and sets down naught in malice. Its desire is to cultivate fair discussion, that out of the healthy exchange of views may come in matters political, social and educational, measures calculated to promote the well-being of the people and the prosperity of the land which all sound Canadians delight to call their own. A fancy logo for “The Flaneur,” typical of those appearing in the paper at the time. The Mail and Empire, October 2, 1897. Building on the success of its columnists, the paper created more distinct pages with ornate logos. Regular features included “On Dit” (society news), “Military News,” and a fashion page. Readers were promised detailed articles on the sciences, and the city’s best coverage of “manly sports.” The weekend fiction selections picked up from syndication included stories by Arthur Conan Doyle, H. Rider Haggard, Joel Chandler Harris, Bret Harte, and Rudyard Kipling. 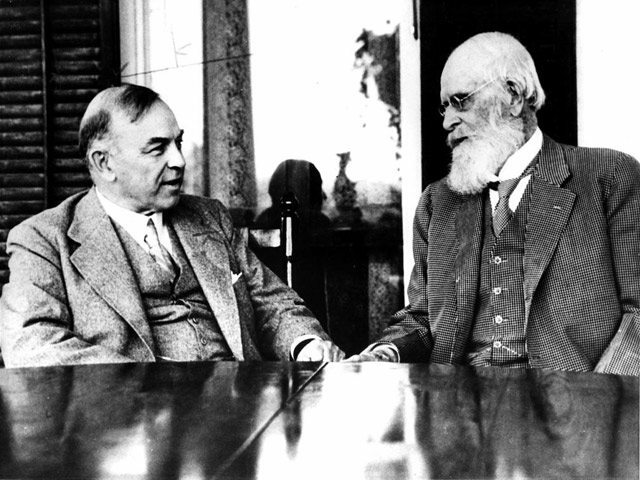 William Lyon Mackenzie King and Sir William Mulock, circa 1935. City of Toronto Archives, Fonds 1244, Item 2199. King’s series ended suddenly in October 1897 after a piece on the “sweating system” of worker exploitation. Preparing his next article, he was horrified to discover a sweatshop that paid women four cents an hour to make uniforms for the post office. Hoping to avoid embarrassing Liberals in a Tory paper, King approached an old family friend, postmaster general William Mulock, who was as shocked as King at the revelation. While King attended Harvard, he simultaneously worked on a report for Mulock regarding federal connections to sweatshops, which led to tougher sourcing guidelines. King’s connection with Mulock aided his political career, but the path he chose didn’t endear him to the Mail and Empire. When King became federal Liberal leader in 1919, the paper attacked him daily for his inadequacies. While King’s association with the Mail and Empire was brief, a reporter who arrived months later developed a stronger connection. Cabbagetown native John Verner McAree’s journalistic career began when he was assigned to write letters to the editor in the Star. After nine days of that, he moved over to the Mail and Empire, where he initially covered who passed through town via hotels and railways. McAree then assumed the halls beat (labour and fraternal organization meetings), and acted as police reporter and children’s columnist. Next assignment: a daily, unsigned column providing backgrounders on the news of the day. When it debuted on January 12, 1903, “The Fourth Column” (as it was eventually known) tackled Jules Verne’s contention that novels were on their way out, with their place in popular culture supplanted by newspapers. McAree disagreed, and noted a half-century later that time supported him. Cover of Culled from Our Columns by J.V. McAree (Toronto: Longmans, 1962). 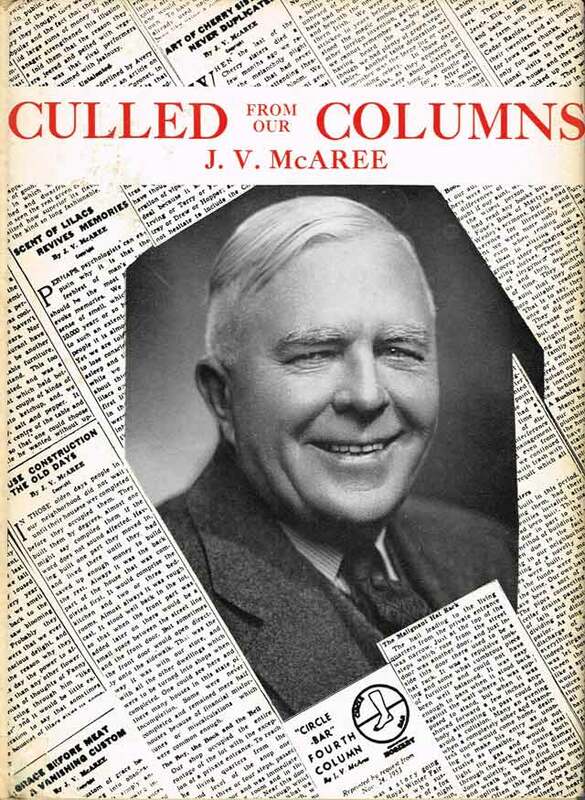 Over time, “The Fourth Column” evolved into a mix of backgrounders, McAree’s musings, recommendations of favourite mystery stories, and letters from readers. McAree, according to longtime Globe and Mail editor Richard J. Doyle, “bashed away at bigotry, pettiness, and pomposity.” Though regarded as an embodiment of tolerance, McAree wasn’t immune from attack, especially from temperance advocates who felt his opposition to prohibition made him a dupe for the liquor interests. The respect that McAree engendered among his peers and employers resulted in few columns being spiked over the 55-year run of “The Fourth Column” in the Mail and Empire and the Globe and Mail. When the column reached its 50th anniversary in 1953, McAree compared himself to a baseball player continually being surprised at being paid for something he loved. “While I don’t say I would have written all my columns for nothing,” McAree joked, “I do say the writing of them has brought me much pleasure. My last column will, I hope, appear the day after my funeral, so that at the last I will be one up on the old boy with the sandglass and the scythe.” His prediction was almost precise: his last column was published the day he was laid in the ground in 1958. 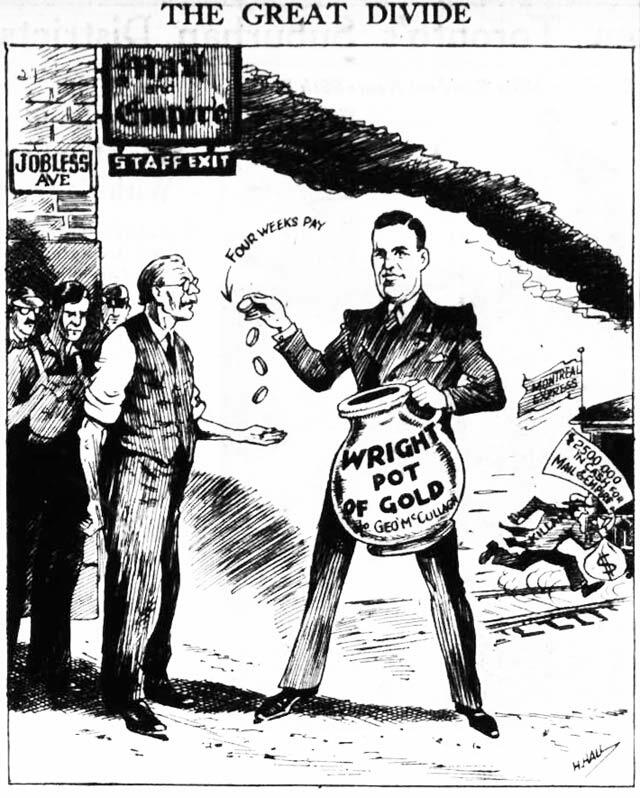 During the early fall of 1927 rumours swirled about the future ownership of the paper, which by this time included members of the Douglas and Riordan families, as well as Canadian Bank of Commerce president Sir John Aird. The stories centred on one of Canada’s most reclusive millionaires. Named after the author of an angling guide, Izaak Walton Killam shunned the spotlight. Through a mixture of extreme shyness and parents who taught him to respect the privacy of others, Killam was an enigma for most of his life. While in his most relaxed moments he displayed a dry sense of humour, he could sit for hours without uttering a word. When family members criticized this behaviour, he responded, “if you have nothing to say, don’t say anything.” He disarmed nosy reporters with a quick smile. Izaak Walton Killam. A Very Private Person by Douglas How (Halifax: Trustees of the Estate of Dorothy J. Killam, 1976). Raised in Nova Scotia, Killam gained attention as a protégé of Max Aitken (later Lord Beaverbrook) who gradually assumed control of Royal Securities. His investments spread over industries ranging from chocolate to utilities. 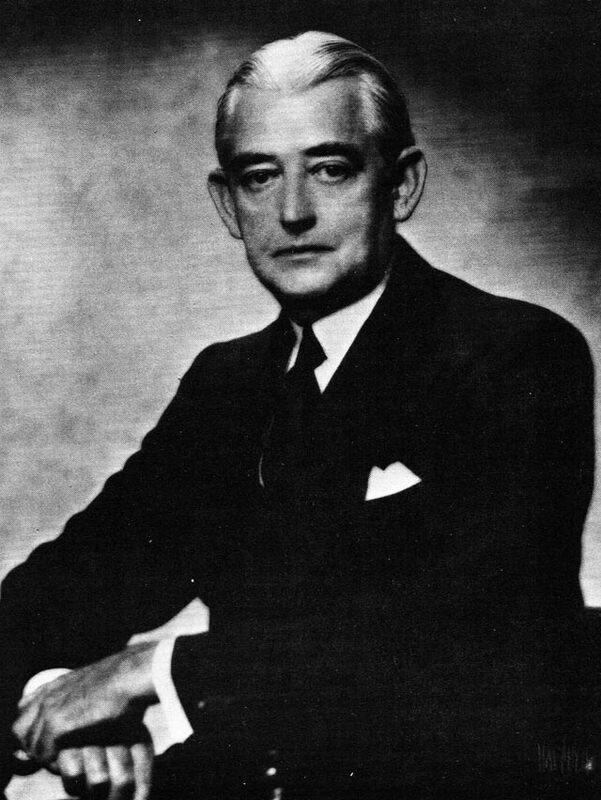 During the early 1920s Killam’s reputation was nearly ruined through his involvement in backing the unsuccessful expansion efforts of the Riordon pulp and paper interests. He soon regained his standing in the financial community thanks to his tough, ethical nature. Shortly before the rumours of his interest in the Mail and Empire began, the Montreal-based Killam had launched Ottawa Valley Power Company to building a joint project along the Ottawa River with Ontario Hydro. I took advantage of an opportunity to acquire what I consider a splendid business investment with great possibilities of improvement. I intend to spend as much time in Toronto as I can spare from other activities. It may be that I shall find the newspaper very fascinating. It may be that in six months I shall tire of active association with it. Killam proved an ideal absentee owner. On rare visits to the paper’s office, he quietly chatted with reporters. He gave the editorial department a free hand, believing staff operated better without his interference. When former prime minister Sir Robert Borden urged Killam to hire a loyal Tory editorial writer who was unhappy at another paper, Killam wrote back that he discussed the matter with Scott and understood that the Mail and Empire didn’t want this particular hack. On another occasion, the news editor phoned Killam about publishing one more article in a series which had led to threats of legal action. Killam asked him one question: “If you had to do it all over again, would you run the articles?” When the editor said yes, Killam gave the go-ahead, indicating he would consult a lawyer the next morning. No lawsuits occurred. 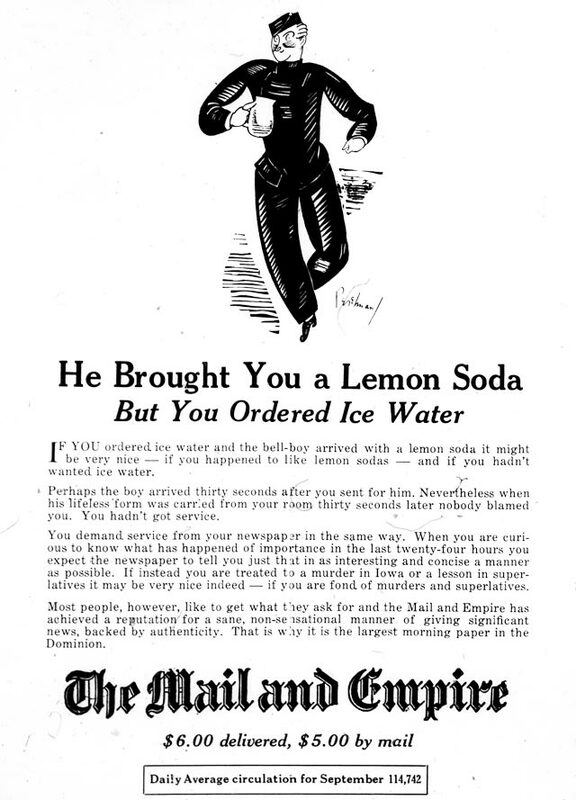 Advertisement, the Mail and Empire, January 2, 1932. Over the years, the Mail and Empire acquired the remnants of two competitors: the Times (formerly its sibling paper the News) in 1919, and the World in 1921. By the mid-1930s, with only two morning papers left in Toronto, observers wondered when it would swallow up the older but weaker Globe. Circulation figures for 1936 showed the Mail and Empire distributed 118,389 copies, the Globe 78,736. Employees at the Globe tended to be paid less, thanks to owner W.G. Jaffray’s preference for enriching his church over his workers. Front page, the Mail and Empire, November 19, 1936. 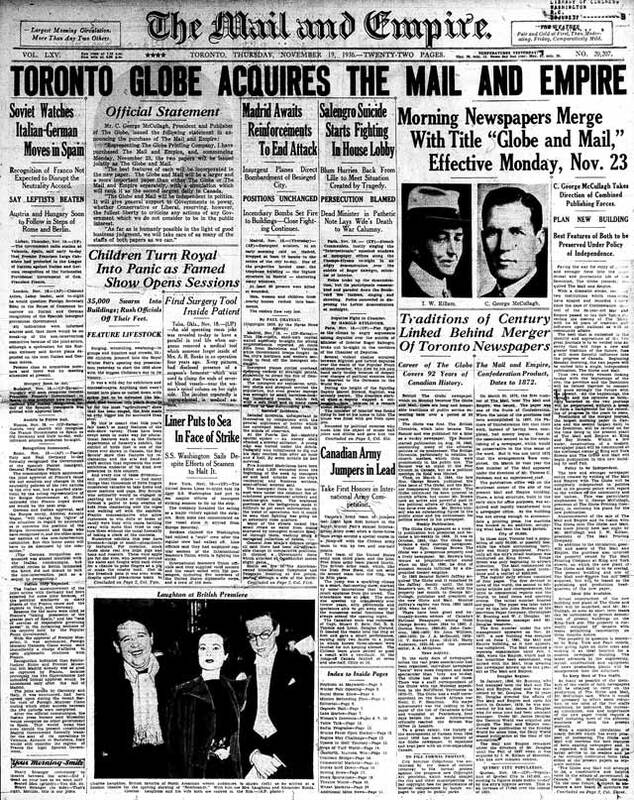 In October 1936, mining millionaire William H. Wright and financial whiz kid George McCullagh purchased the Globe. On November 19, after less than a week of negotiation with Killam (which McCullagh described as “comparatively easy and of the most pleasant nature”), the pair purchased the Mail and Empire. Wright admitted that a merger had been on his mind since his initial purchase. The new paper, the Globe and Mail, would debut on November 23. 1936 and be produced from the Mail and Empire’s offices at King and Bay until a new building was finished near King and York (the Mail building was demolished in 1939 for a Bank of Montreal office tower, which itself was replaced in the 1970s). Cartoon, the Telegram, November 23, 1936. If the hyperbolic coverage in the Telegram is believed, Toronto Conservatives and Orangemen were aghast at the news that the Liberal Globe was taking over their morning paper. The Telegram’s phone lines were flooded with calls urging the evening paper to launch a morning edition to fill the void. We have a little trouble believing some of the responses the Telegram printed, such as the woman who claimed the loss of the Conservative voice of the Mail and Empire made her feel so rotten she couldn’t finish her ironing, or the man who drove in from Brantford to plead for a morning edition. While a group within the Conservative party considered buying the Mail and Empire, they failed to raise enough money to satisfy Killam, who reportedly received $2.5 million for the paper. Preparing the final edition of the Mail and Empire. The Telegram, November 21, 1936. Among those initially let go was William Arthur Deacon, Canada’s first full-time professional book critic. As literary editor of the Mail and Empire since 1928, Deacon had championed Canadian literature and grown a loyal following for his nurturing attitude. When the papers merged, literary duties were handed to the Globe’s Charles Jenkins. The backlash from staff, readers, and the literary community was such that within a week, Deacon was rehired with a higher pay rate. He stayed in the role for the next quarter-century. While Deacon and fellow Mail and Empire columnists like McAree settled into their new home at the Globe and Mail, the Telegram ferociously attacked the new paper. It was upset by alleged abandonment of Conservative readers and McCullagh’s increasingly cozy ties with Liberal Ontario premier Mitch Hepburn. 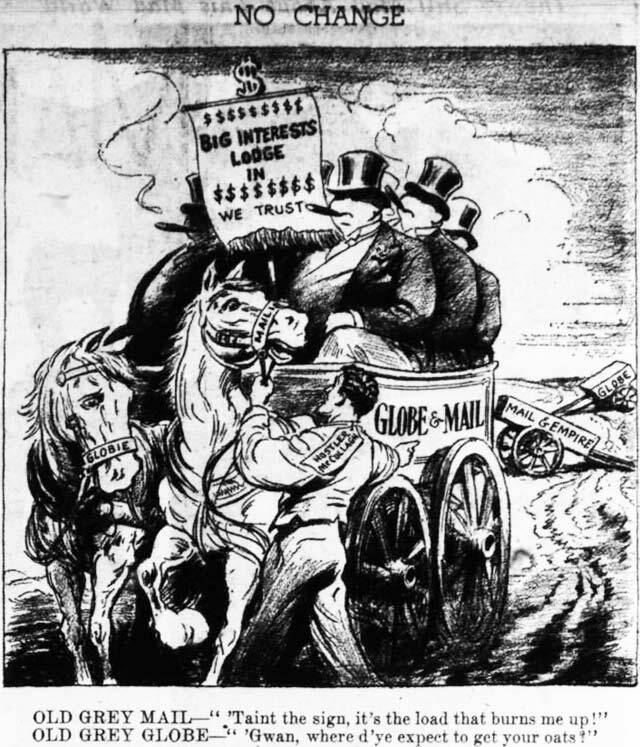 Via daily editorials and front page stories, the Telegram depicted the merger of the papers as a conspiracy designed to silence opposition to improved educational funding for Catholic schools. The Telegram needn’t have been so paranoid, as the loss of a morning Conservative voice didn’t last long. By the Second World War, McCullagh fell out with Hepburn and the Liberal party in general, and shifted the Globe and Mail’s politics rightward. 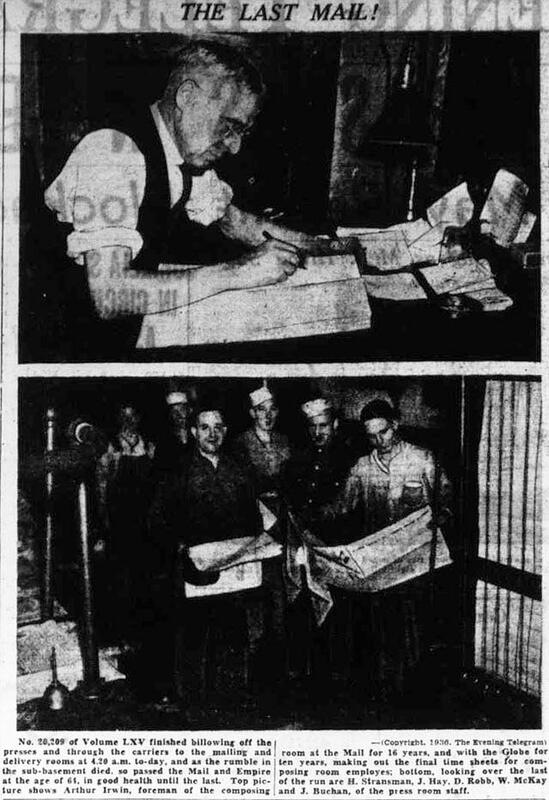 In 1948, he added the Telegram to his holdings. Cartoon depicting George McCullagh and Izaak Walton Killam, the Telegram, November 26, 1936. Meanwhile, Killam followed the status of former Mail and Empire employees who had difficulty finding work. In January 1937 he paid the remaining 30 or so workers affected one week’s pay for each year they had spent at the Mail and Empire, and assured pensioners they would continue to receive money. Killam remained an enigmatic figure until his death in 1955. Shunning attention for his actions in life—he quietly helped out employees as long as they never publicly revealed his involvement—posthumously he proved one of the country’s greatest philanthropists. He directed that the inheritance taxes levied on his estate be used to aid public institutions, resulting in a large portion of the initial funding of the Canada Council. When his widow died a decade later, both had set up provisions in her will to fund academic research and medical institutions across the country. Within the Globe and Mail, the Mail’s legacy faded as former employees moved on. Apart from a few clippings, the paper’s files weren’t retained, nor were bound copies of the paper. Richard Doyle once asked Globe and Mail publisher Jim Cooper why, given its legacy was buried, the paper never dropped the Mail from its masthead. “For a very good reason,” Cooper responded. “There are lots of Globes—like the Boston Globe—but there is only one Globe and Mail!” The paper can’t even find respect in the digital age—the Globe & Mail’s online archives doesn’t include it, while an incomplete run of issues published between 1881 and 1900 were included in Google’s discontinued newspaper digitalization project. Though all but forgotten, both the Mail and the Mail and Empire played important roles in the evolution of Canadian newspapers from party mouthpieces to fully rounded publications. A promotional boast that “The Mail Does It All” wasn’t far from the mark. Additional material from Hurly-Burly by Richard J. Doyle (Toronto: Macmillan, 1990); A Very Private Person by Douglas How (Halifax: Trustees of the Estate of Dorothy J. Killam, 1976); King by Allan Levine (Toronto: Douglas & McIntrye, 2011); William Arthur Deacon: A Canadian Literary Life by Clara Thomas and John Lennox (Toronto: University of Toronto Press, 1982); the February 6, 1895 edition of the Empire; the October 1, 1927 and November 19, 1936 editions of the Globe; the January 6, 1937, July 24, 1950, January 10, 1953,and August 9, 1977 editions of the Globe and Mail; the February 7, 1895, September 18, 1897, January 12, 1903, November 19, 1936, and November 21, 1936 editions of the Mail and Empire; the February 6, 1895,February 8, 1895, October 1, 1927, November 19, 1936, and November 20, 1936 editions of the Toronto Star; and the February 7, 1895, November 19, 1936, and November 21, 1936 editions of the Telegram.